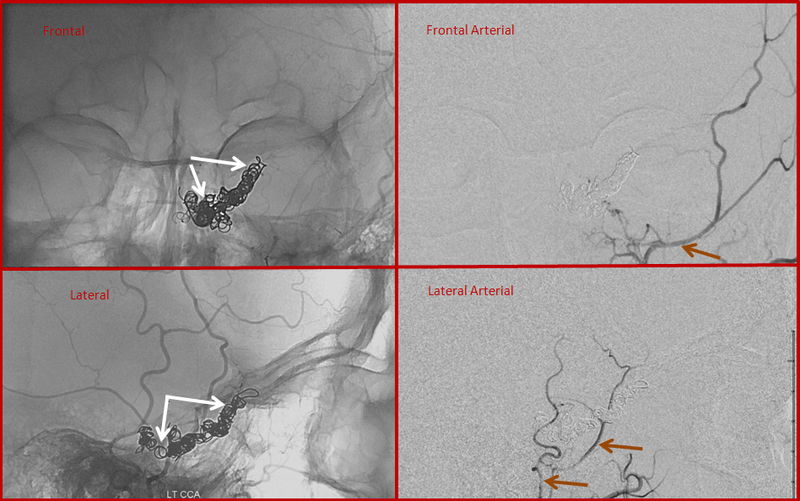 This patient came to the emergency department with bulging, red, swollen left eye, and was subsequently found to harbor a high flow cavernous sinus dural fistula. The fistula (approximately located where red arrow points to) is supplied from innumerable branches of the ILT and IMAX (green arrows). 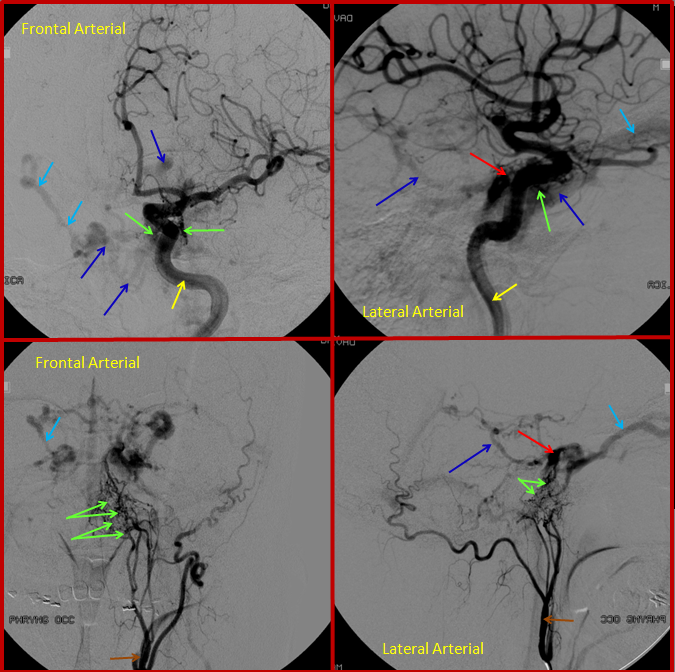 Many veins are seen, including contralateral ophthalmic vein (light blue) and basal vein (dark blue), and deep veins of the brain (pink arrow) and cavernous sinus region veins (dark blue arrows). After glue injection into a relatively promising IMAX branch, the fistula is still “alive”, though the flow through it has diminished. Thus, veins (dark and light blue arrows) are still seen in the arterial phase. The remaining fistula (red arrow region) cannot be embolized through the myriad tiny feeding vessels (green arrows). 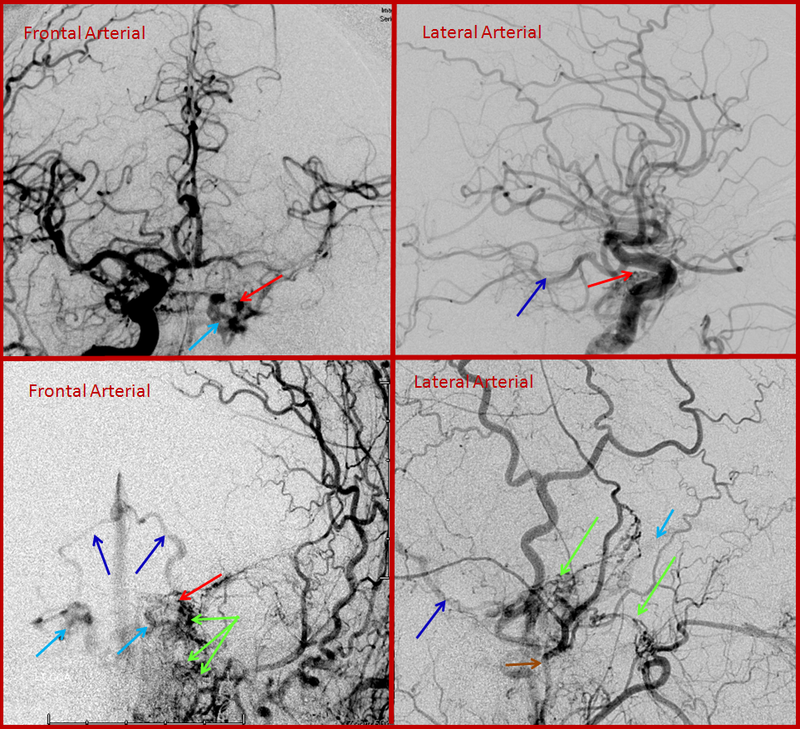 Transvenous approach through the jugular did not reach the cavernous sinus. Therefore, the ophthalmic vein was cannulated directly following a cutdown by an ophthalmic surgeon. 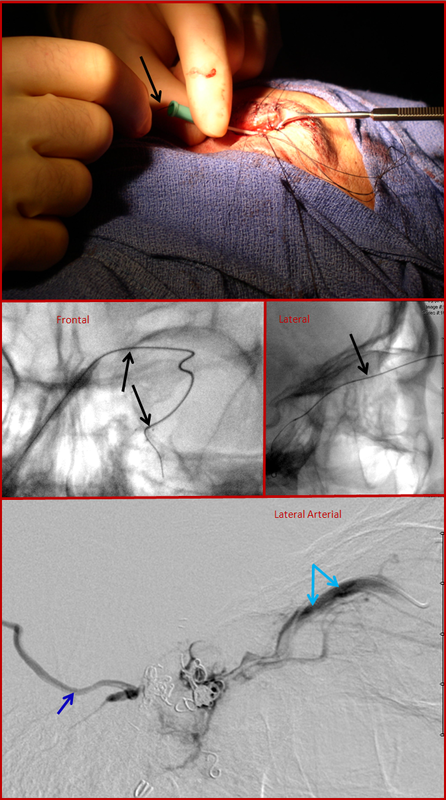 An angiocath is sutured into the vein, and a microguidewrire/microcatheter used to catheterize the cavernous sinus. The bottom picture is cavernous sinus venogram, demonstrating the basal vein (dark blue) and ophthalmic vein (light blue arrows). Some coils have already been placed into the sinus. Special care should be taken during this kind of access, since the ophthalmic vein is relatively fragile, and its perforation produces an intraconal hematoma. The patient’s eye before and following embolization.